Editor's Note: I also read this book in high school, which details the story of the Buddha, and it was definitely a life-changing read! Coming of age in the 1960’s had a profound impact on my emerging adulthood. In high school English class I encountered Herman Hesse’s “Siddhartha.” It changed my life forever, and started me off on a path that continues to unfold to this day. As an undergraduate at the Eastman School of Music, I was always drawn to the meaning of art, and the person: the creator, the performer. I read the letters of Brahms and Van Gogh, and found in them fascinating insights into the creative process and the artist’s psyche. The idealist in me loved the idea of art as a means to enlightenment, of art as the expression of the soul’s deepest yearnings. Eugen Herrigel, with his “Zen in the Art of Archery,” captured these feelings; I believed that this intense pursuit of excellence, beauty and skill served an even greater purpose in the evolution of an artist, beyond ego and fame. My first job after graduating from Eastman was playing in the National Symphony of Coast Rica. There I encountered a world of performers and thinkers who expanded my understanding of human potential, artistic expression and the idea of wholeness in mind and body. The human potential movement was in its heyday then. After my Costa Rican experience, I came to Boston for graduate study; it was no surprise that after several years of teaching and playing professionally, I ended up pursuing graduate degree in holistic counseling psychology. These studies informed my teaching and playing in ways a graduate music degree could not have. Over the years I have given many workshops in mental skills, performance enhancement and for the past seven years, I have taught in the Mind/Body program of the Longy School of Music of Bard College. In 2005, having read Jon Kabat-Zinn’s books and used his meditation recordings for years, I enrolled in the Mindfulness Based Stress Reduction course at the Center for Mindfulness at U. Mass. Medical School, in Worcester, MA, and began my formal meditation practice. In 2009, I completed the teacher-training program. So here I am, nine years later. How has this simple, yet profound practice changed my life and impacted my music making? We musicians are no strangers to discipline, and we have first-hand experience with the power of the mind/body connection. Live music performance is, by nature, a “present moment” experience. We spend countless hours honing our technical skills in the practice room, yet, quite often it’s our minds that derail us. My meditation practice gives me a daily opportunity to practice being present in the moment—it’s the essence of the mental discipline we need for making music, and the essence of being present for your life. Most powerfully, meditation has given me a different relationship to my thoughts: By observing our thoughts in meditation, we begin to see, over and over again, that we can choose to respond to thoughts, rather than react. We have our thoughts, but we are not our thoughts. In a technical, practical sense, meditation has deepened the kind of awareness we performers rely upon: an awareness of the body, as well as the mind. Where do we have tension, how much effort do we need for a passage? What am I telling myself about this concert, this passage, this colleague, and this music? Am I present right now, or am I worrying about something that hasn’t happened, or something that just did happen? What is here right now? Certainly my concentration in general has improved. I am less distracted, and when I do succumb, I know it, and can often let it go and return to the present, an ability that our “culture of distraction” constantly attempts to take away from us. One of the most dramatic realizations I have experienced is that I am not at the mercy of the turbulent, often dark, overwhelming feelings I used to experience in the past. Surprisingly, after a few years of meditation practice, I feel like I am wearing some kind of “life preserver” that keeps me afloat: no matter how much I am thrown around by my emotions and perceptions, I just can’t sink. Coming from a family with a long, intergenerational history of depression, this is no small thing. Another feeling I have is that of being in the eye of a storm: like those dramatic weather photos of hurricanes that show the clear, blue eye. When I meditate, I often feel as though I am in that eye. I can feel the pull of the storm, I know it’s there….and sometimes, it does get me! But there is this sense of being able to step outside the raging winds. Editor's note: This is a piece of calligraphy by Thich Nhat Hanh. Can you take a moment, reading this on your phone or computer to notice the quality of your breath and how you feel in this moment? Practicing meditation is not a chore for me. It’s something I savor and look forward to, like a cool drink of water when one is thirsty. Mindfulness as a way of life has enabled me, to be present for the beauty, connection, and meaning of the moment—in the simplest ways. There are so many moments throughout the day to experience joy, beauty, and connection—to really be present with the people I care about, to hear the music I play. To experience my life as it is unfolding—now. Meditation practice has deepened my compassion for myself, and others. It has made me aware of the interconnection we share with each other, the audience, and the world! Best of all, in any moment, wherever I am, I know that I can come home to my breath, and wake up to the present, my life, in “real” time! My favorite book of Kabat-Zinn’s is Wherever You Go There You Are. I like to read one page daily after I meditate. The endearing and wise Zen master, poet, author, teacher Thich Nhat Hanh has written over 30 books—all of them informative and readable. My favorites are: Peace is Every Step; The Path of Mindfulness in Everyday Life (Bantam Books) and The Miracle of Mindfulness. (Beacon Press). What greater gift can we give ourselves but to be present for the precious moments of our lives. Most of us musicians understand "fight or flight," or at least we've felt it, but we often lack the understanding of what the rest of the nervous system is doing. Our nervous system consists of the Central Nervous System (brain and spinal cord) and the Peripheral Nervous Stem (cranial and spinal nerves), which basically work in a feedback loop of information with the motor and sensory aspects. Within the peripheral nervous system are the somatic, enteric, and autonomic systems. Somatic can be conscious or unconscious, and results in movement of skeletal muscles as a response to sensory input. Simply put, the somatic system moves your body. The enteric system consists of the 100 million neurons of your GI system, and the various actions needed for homeostasis. 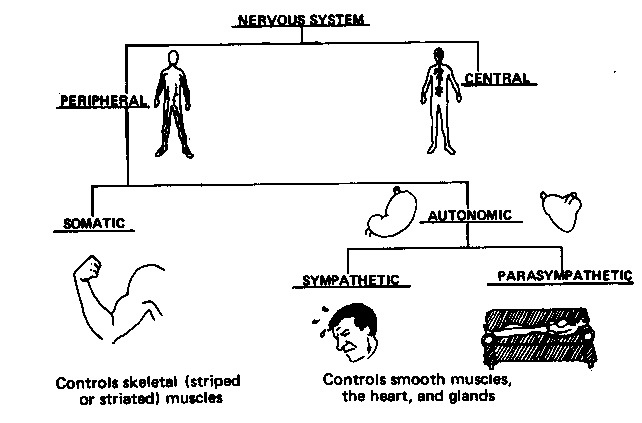 The autonomic system is unconscious and regulates internal organs. 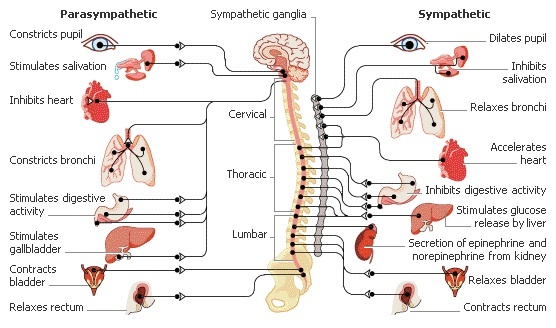 Within the autonomic system are two more divisions: the sympathetic and the parasympathetic systems (now we're in more familiar ground!). The sympathetic system is what's responsible for our "fight or flight" response, which causes our breath to shorten, eyes to dilate, heart rate to increase, and a few other things. Most of us know this well from performing and public speaking! Our parasympathetic system is the compliment, in charge of day to day functions of organs, cellular repair, etc.